Kazakh or Kazak (Cyrillic: қазақша or қазақ тілі; Arabic: قازاقشا‎ or قازاق تئلئ‎; pronounced [qɑzɑqˈɕɑ], [qɑˈzɑq tɪˈlɪ]), belongs to the Kipchak branch of the Turkic languages. It is closely related to Nogai, Kyrgyz and Karakalpak. Kazakh is the official language of the Republic of Kazakhstan and a significant minority language in the Ili Kazakh Autonomous Prefecture in Xinjiang, China and in the Bayan-Ölgii Province of Mongolia. Kazakh is also spoken by many ethnic Kazakhs through the former Soviet Union (approximately 472,000 in Russia according to the 2010 Russian Census), Afghanistan, Iran, Turkey and Germany. Like other Turkic languages, Kazakh is an agglutinative language and it employs vowel harmony. In October 2017, Kazakh President Nursultan Nazarbayev decreed that the government would transition from using Cyrillic to the Latin alphabet by 2025. President Nazarbayev signed on February 19, 2018 an amendment to the decree of October 26, 2017 No. 569 "On translating the Kazakh alphabet from Cyrillic alphabet to the Latin script." The amended alphabet uses Sh and Ch for the Kazakh sounds "Ш" and "Ч" and eliminates the use of apostrophes. The Kazakh language (often called Qazaqsa) has its speakers (mainly Kazakhs) spread over a vast territory from the Tian Shan to the western shore of the Caspian Sea. Kazakh is the official state language of Kazakhstan, with nearly 10 million speakers (based on information from the CIA World Factbook on population and proportion of Kazakh speakers). In China, nearly two million ethnic Kazakhs and Kazakh speakers reside in the Ili Kazakh Autonomous Prefecture of Xinjiang. The oldest known written records of languages closely related to Kazakh were written in the Old Turkic alphabet, though it is not believed that any of these varieties were direct predecessors of Kazakh. Modern Kazakh, going back approximately one thousand years, was written in the Arabic script until 1929, when Soviet authorities introduced a Latin-based alphabet, and then a Cyrillic in 1940. In presenting a strategic plan in April 2017, Kazakh President Nursultan Nazarbayev described the twentieth century as a period in which the "Kazakh language and culture have been devastated". Nazarbayev ordered Kazakh authorities to create a Latin Kazakh alphabet by the end of 2017, so written Kazakh could return to a Latin script starting in 2018. As of 2018[update], Kazakh is written in Cyrillic in Kazakhstan and Mongolia, Kazakh is written in Latin in Kazakhstan, while more than one million Kazakh speakers in China use an Arabic-derived alphabet similar to the one that is used to write Uyghur. On October 26, 2017, Nazarbayev issued Presidential Decree 569 for the change to a finalized Latin variant of the Kazakh alphabet and ordered that the government's transition to this alphabet be completed by 2025, a decision taken to emphasise Kazakh culture after the era of Soviet rule and to facilitate the use of digital devices. But the initial decision to use a novel orthography employing apostrophes, which make the use of many popular tools for searching and writing text difficult, has generated controversy. The alphabet was revised the following year by Presidential Decree 637 of 19 February 2018 and the use of apostrophes was discontinued and replaced with the use of diacritics and digraphs. Nazarbayev first brought up the topic of using the Latin alphabet instead of the Cyrillic alphabet as the official script for Kazakh in Kazakhstan in October 2006. A Kazakh government study released in September 2007 said that a switch to a Latin script over a 10- to 12-year period was feasible, at a cost of $300 million. The transition was halted temporarily on December 13, 2007, with President Nazarbayev declaring: "For 70 years the Kazakhstanis read and wrote in Cyrillic. More than 100 nationalities live in our state. Thus we need stability and peace. We should be in no hurry in the issue of alphabet transformation." However, on January 30, 2015, the Minister of Culture and Sports Arystanbek Mukhamediuly announced that a transition plan was underway, with specialists working on the orthography in order to accommodate the phonological aspects of the language. However, many citizens state that the officially introduced alphabet needs lots of improvements and changes. Moreover, Kazakh becomes the only Turkic language which will be using Sh, Ch, after the intentions of the Uzbek government to abandon the Sh, Ch digraphs due to its impracticality. Барлық адамдар тумысынан азат және қадір-қасиеті мен құқықтары тең болып дүниеге келеді. Адамдарға ақыл-парасат, ар-ождан берілген, сондықтан олар бір-бірімен туыстық, бауырмалдық қарым-қатынас жасаулары тиіс. بارلىق ادامدار تۋمىسىنان ازات جانە قادىر-قاسيەتى مەن كۇقىقتارى تەڭ بولىپ دۇنيەگە كەلەدى. ادامدارعا اقىل-پاراسات، ار-وجدان بەرىلگەن، سوندىقتان ولار ٴبىر-بىرىمەن تۋىستىق، باۋىرمالدىق قارىم-قاتىناس جاساۋلارى ٴتيىس. Barlyq adamdar týmysynan azat jáne qadir-qasıeti men quqyqtary teń bolyp dúnıege keledi. Adamdarǵa aqyl-parasat, ar-ojdan berilgen, sondyqtan olar bir-birimen týystyq, baýyrmaldyq qarym-qatynas jasaýlary tıis. Barlık adamdar tuwmısınan azat jäne kadir-kasiyeti men kukıktarı teń bolıp düniyege keledi. Adamdarga akıl-parasat, ar-ojdan berilgen, sondıktan olar bir-birimen tuwıstık, bawırmaldık karım-katınas jasawları tiyis. All human beings are born free and equal in dignity and rights. They are endowed with reason and conscience and should act towards one another in a spirit of brotherhood. Kazakh exhibits tongue-root vowel harmony, with some words of recent foreign origin (usually of Russian or Arabic origin) as exceptions. There is also a system of rounding harmony which resembles that of Kyrgyz, but which does not apply as strongly and is not reflected in the orthography. The following chart depicts the consonant inventory of standard Kazakh; many of the sounds, however, are allophones of other sounds or appear only in recent loan-words. The 18 consonant phonemes listed by Vajda are without parentheses—since these are phonemes, their listed place and manner of articulation are very general, and will vary from what is shown. The phonemes /f/, /v/, /t͡ɕ/ and /x/ only occur in recent borrowings, mostly from Russian. In the table, the elements left of a divide are voiceless, while those to the right are voiced. Kazakh has a system of 12 phonemic vowels, 3 of which are diphthongs. The rounding contrast and /æ/ generally only occur as phonemes in the first syllable of a word, but do occur later allophonically; see the section on harmony below for more information. Moreover, the /æ/ sound has been included artificially due to the influence of Arabic, Persian and, later, Tatar languages during the Islamic period. According to Vajda, the front/back quality of vowels is actually one of neutral versus retracted tongue root. Phonetic values are paired with the corresponding character in Kazakh's Cyrillic and current Latin alphabets. Kazakh is generally verb-final, though various permutations on SOV (subject–object–verb) word order can be used, for example, due to topicalization. Inflectional and derivational morphology, both verbal and nominal, in Kazakh, exists almost exclusively in the form of agglutinative suffixes. Kazakh is a nominative-accusative, head-final, left-branching, dependent-marking language. The declension of the pronouns is outlined in the following chart. Singular pronouns (with the exception of сіз, which used to be plural) exhibit irregularities, while plural pronouns don't. Irregular forms are highlighted in bold. Kazakh may express different combinations of tense, aspect and mood through the use of various verbal morphology or through a system of auxiliary verbs, many of which might better be considered light verbs. The present tense is a prime example of this; progressive tense in Kazakh is formed with one of four possible auxiliaries. These auxiliaries "отыр" (sit), "тұр" (stand), "жүр" (go) and "жат" (lie), encode various shades of meaning of how the action is carried out and also interact with the lexical semantics of the root verb: telic and non-telic actions, semelfactives, durative and non-durative, punctual, etc. There are selectional restrictions on auxiliaries: motion verbs, such as бару (go) and келу (come) may not combine with "отыр". Any verb, however, can combine with "жат" (lie) to get a progressive tense meaning. Men jeymin non-progressive "I (will) eat [every day]." Men jeudemin progressive "I am eating [right now]." Men jep otırmın progressive/durative "I am [sitting and] eating." / "I have been eating." Men jep turmın progressive/punctual "I am [in the middle of] eating [this very minute]." Men jep jürmin habitual "I eat [lunch, everyday]"
"The/A fish is swimming in the water"
water-LOC fish swim-CNVB AUX.3 жүр – "go", dynamic/habitual/iterative "The fish is swimming [as it always does] in the water"
"The fish is swimming in the water"
In addition to the complexities of the progressive tense, there are many auxiliary-converb pairs that encode a range of aspectual, modal, volitional, evidential and action- modificational meanings. For example, the pattern -ып көру, with the auxiliary verb көру (see), indicates that the subject of the verb attempted or tried to do something (compare the Japanese てみる temiru construction). Еліме қарашы! El-im-e qara-shy Just look at my country! Даңқымыз шықты ғой Dańq-ymyz shyq-ty ǵoı Our glory, emerged! Қазағым мықты ғой Qazaǵ-ym myqty ǵoı Mighty are my Kazakh people! ^ "Results of the 2009 national population census of the Republic of Kazakhstan" (PDF). The agency on statistics of the Republic of Kazakhstan. Retrieved 1 November 2017. .
^ "Нормативные правовые акты субъектов Российской Федерации" [Normative legal acts of the subjects of the Russian Federation] (in Russian). Министе́рство юсти́ции Росси́йской Федера́ции. December 19, 2013. Archived from the original on September 25, 2015. Retrieved February 19, 2016. ^ Hammarström, Harald; Forkel, Robert; Haspelmath, Martin, eds. (2017). "Kazakh". Glottolog 3.0. Jena, Germany: Max Planck Institute for the Science of Human History. ^ "Kazakhstan to change from Cyrillic to Latin alphabet | DW". Deutsche Welle (www.dw.com). 2017-10-27. Retrieved 2018-03-28. ^ "This Country Is Changing Its Stalin-imposed Alphabet After 80 Years". Newsweek. ^ "Central Asia: Kazakhstan". The 2017 World Factbook. Central Intelligence Agency. October 26, 2017. Archived from the original on October 30, 2017. Retrieved October 31, 2017. ^ Simons, Gary F.; Fennig, Charles D., eds. (2017). "Kazakh". Ethnologue: Languages of the World (20th ed.). Dallas, Texas: SIL International. Retrieved October 28, 2017. ^ a b c d e f g h i j k l m n Mukhamedova, Raikhangul (2015). Kazakh: A Comprehensive Grammar. Routledge. ISBN 9781317573081. ^ a b Назарбаев, Нұрсұлтан (April 26, 2017). "Болашаққа бағдар: рухани жаңғыру" [Orientation for the future: spiritual revival]. Egemen Qazaqstan (in Kazakh). Archived from the original on June 28, 2017. Retrieved October 30, 2017. ^ "Kazakh President Orders Shift Away From Cyrillic Alphabet". Radio Free Europe/Radio Liberty. April 12, 2017. Archived from the original on July 6, 2017. Retrieved October 30, 2017. ^ "From Я to R: How To Change A Country's Alphabet -- And How Not To". Radio Free Europe/Radio Liberty. May 16, 2017. Archived from the original on May 23, 2017. Retrieved May 18, 2017. ^ a b "О переводе алфавита казахского языка с кириллицы на латинскую графику" [On the change of the alphabet of the Kazakh language from the Cyrillic to the Latin script] (in Russian). President of the Republic of Kazakhstan. October 26, 2017. Archived from the original on October 27, 2017. Retrieved October 26, 2017. ^ Illmer, Andreas; Daniyarov, Elbek; Rakhimov, Azim (October 31, 2017). "Kazakhstan to Qazaqstan: Why would a country switch its alphabet?". BBC News. Archived from the original on October 31, 2017. Retrieved October 31, 2017. ^ "Nazarbayev Signs Decree On Kazakh Language Switch To Latin-Based Alphabet". Radio Free Europe/Radio Liberty. October 27, 2017. Archived from the original on October 27, 2017. Retrieved October 30, 2017. ^ "Alphabet soup as Kazakh leader orders switch from Cyrillic to Latin letters". The Guardian. 26 October 2017. Archived from the original on October 28, 2017. Retrieved 30 October 2017 – via Reuters. ^ Higgins, Andrew (2018). "Kazakhstan Cheers New Alphabet, Except for All Those Apostrophes". The New York Times. ISSN 0362-4331. Retrieved 2018-01-16. ^ "Kazakhstan switching to Latin alphabet". Interfax. October 30, 2006. Archived from the original on September 30, 2007. ^ "Kazakh President Revives Idea of Switching to Latin Script". Radio Free Europe/Radio Liberty. October 24, 2006. Archived from the original on March 7, 2017. Retrieved October 30, 2017. ^ Bartlett, Paul (September 3, 2007). "Kazakhstan: Moving Forward With Plan to Replace Cyrillic With Latin Alphabet". EurasiaNet. Archived from the original on May 12, 2008. Retrieved October 30, 2017. ^ "Kazakhstan should be in no hurry in Kazakh alphabet transformation to Latin: Nazarbayev". Kazinform. December 13, 2007, cited in "Kazakhstan backtracks on move from Cyrillic to Roman alphabet?". Pinyin News. December 14, 2007. Archived from the original on September 29, 2014. Retrieved October 30, 2017. ^ "Kazakh language to be converted to Latin alphabet – MCS RK". Kazinform. January 30, 2015. Archived from the original on February 19, 2017. Retrieved September 17, 2015. 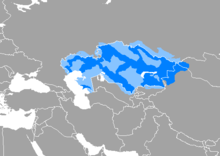 ^ Some variations occur in the different regions where Kazakh is spoken, including outside Kazakhstan; e.g. ж / ج (where a Perso-Arabic script similar to the current Uyghur alphabet is used) is read [ʑ] in standard Kazakh, but [d͡ʑ] in some places. ^ Wagner, John Doyle; Dotton, Zura. A Grammar of Kazakh. Mark Kirchner: "Kazakh and Karakalpak". In: The Turkic languages. Ed. by Lars Johanson and É. Á. Csató. London [u.a.] : Routledge, 1998. (Routledge language family descriptions). S.318-332. Wikivoyage has a phrasebook for Kazakh.